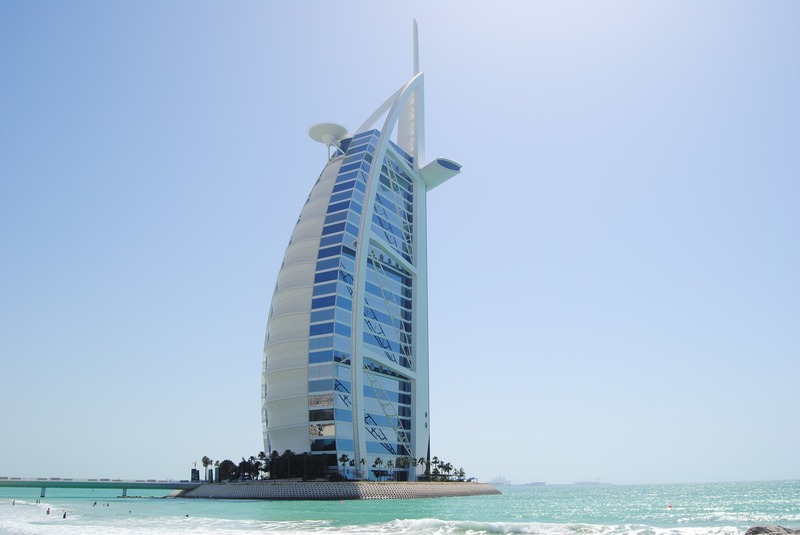 Dubai is a bustling metropolitan that teems with life and luxury. It’s a place you go to experience the finest things in life, and the most extravagant of all lifestyles. 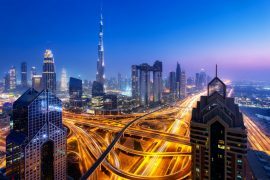 From soaring skyscrapers to bustling markets to adrenaline-inducing activities – there’s plenty of things to do in Dubai. 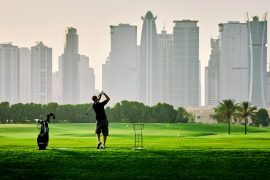 But the problem isn’t what to see in Dubai, it’s where to stay in Dubai. 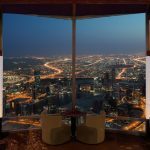 The city boasts hundreds of accommodation options and it might be very hard to decide what the best areas to stay in Dubai are. From completely modern neighborhoods to ones that reflect a rich heritage, the options are endless. Deira has once been the main commercial center of the city of Dubai and was the center of the trading industry. 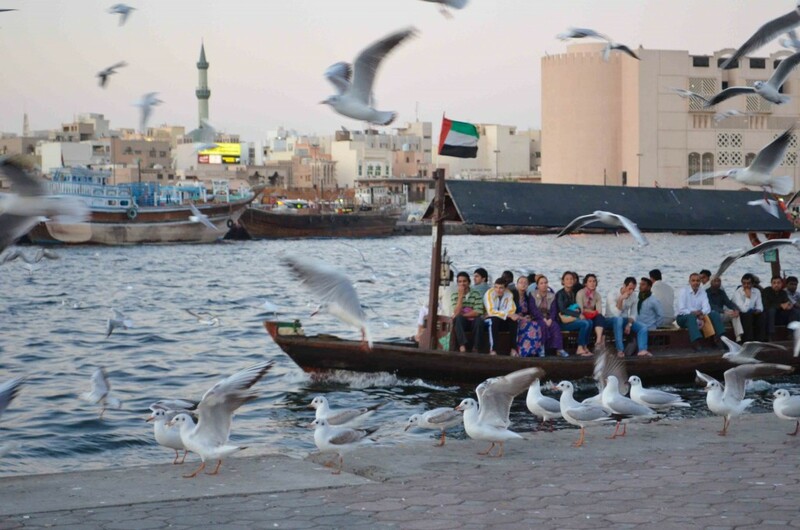 Despite the fact that this has changed, there are a lot of things going on in Deira that reflect a very rich culture that other places in Dubai fail to reflect. It will take you back to the times of dhows and markets and souks that buzz with life and activity. It’s one of the old neighborhoods in Dubai and one that has a very distinct ethnic mixture of cultures. 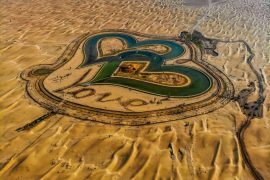 If you want to go to Dubai to be able to wander around places and get lost in the maze of souks. 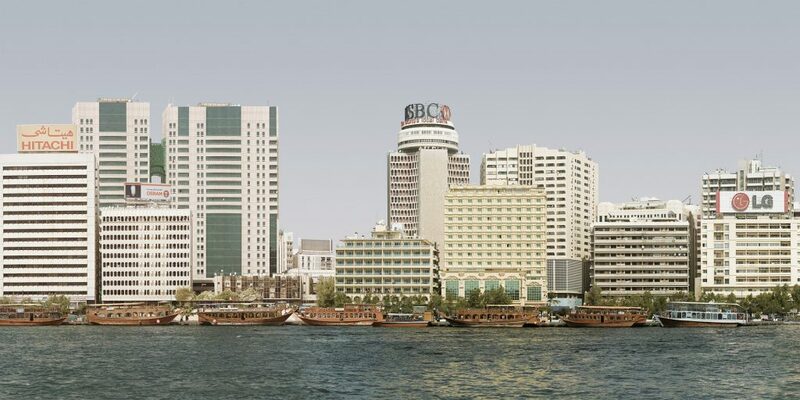 The Dubai Creek is the perfect place to go to if you’re into both history and culture. 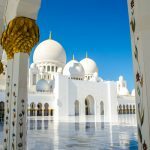 It is definitely not the lavish and Westernized version of Dubai that you’d be used to seeing, but it’s definitely the perfect place for archeological finds, cultural centers and much more. 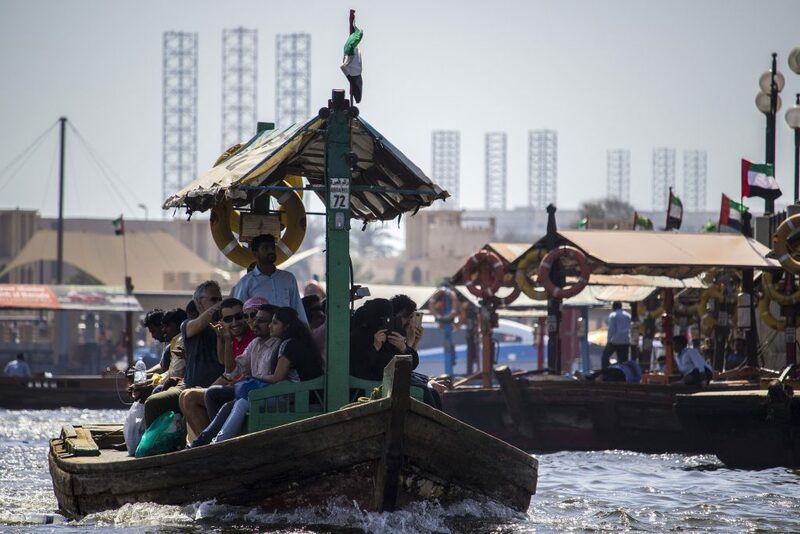 You should definitely try taking a dhow cruise, or an Abra water taxi or check out the multiple museums and cultural sites. There is the Heritage House Museum – which has the perfect historical and cultural gems and shows rooms like Al Majlis, Women’s Guest Rooms, Al Housh, and Al Makhzan along with the bridal room and much more. 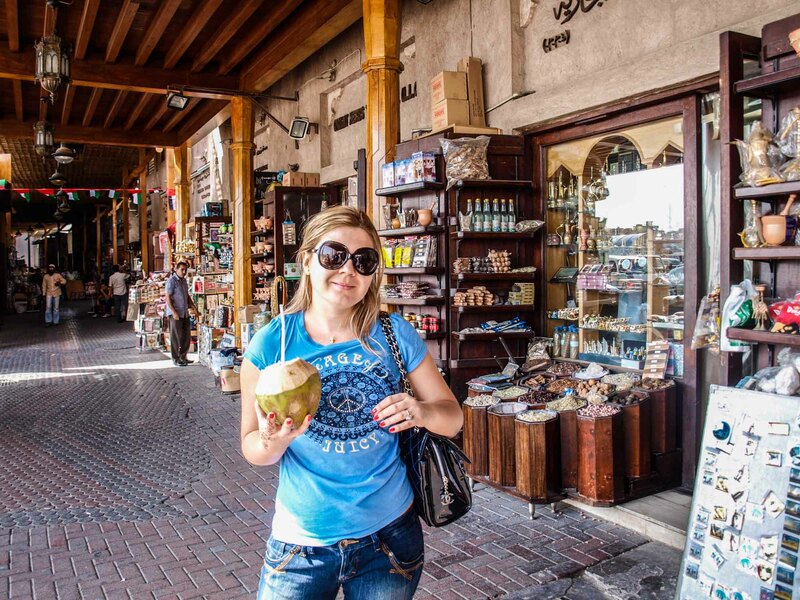 The souks are an ode to the heritage of Dubai and are a delight to explore. Check out the stalls that are filled with all types of seafood – from clams, to crabs to shrimp to a lot more. Don’t forget to bargain. Check out the Gold Souk that shows all types of jewelry with the best Arabic designs and gorgeous precious stones as well. There are over 300 retailers there with some that have been there for over 30 years. The spice souk is also filled with the most exotic of all spices from all over the world and will definitely introduce you to some spices that you’ve never tried before. 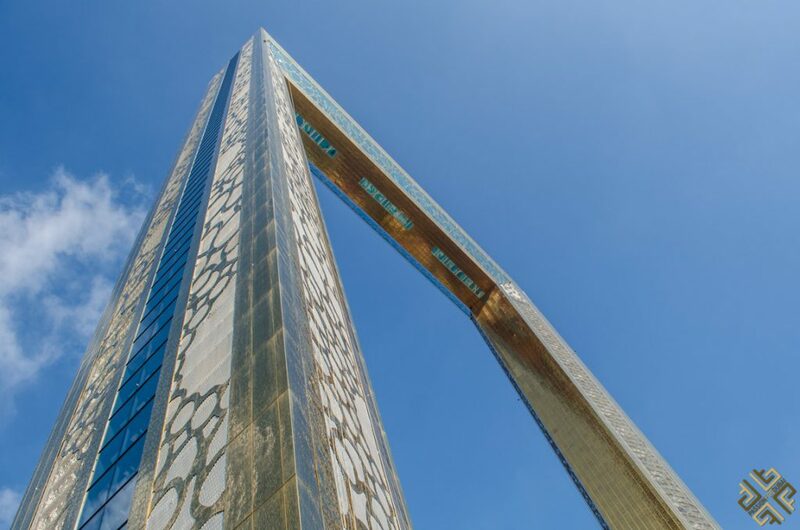 The Dubai Frame is a where you go to check out some of the best architectural attractions in Dubai. Sweeping panoramic vistas of all of Dubai and Deira and the sparkling waters, and the juxtaposition of the vast dunes of the desert. You’ll be walking on a clear glass and it will give you the feeling of walking on thin air. It’ also where you’ll get to gaze out on the souks and the markets and see the blend of new and old through this immensely immersive experience. 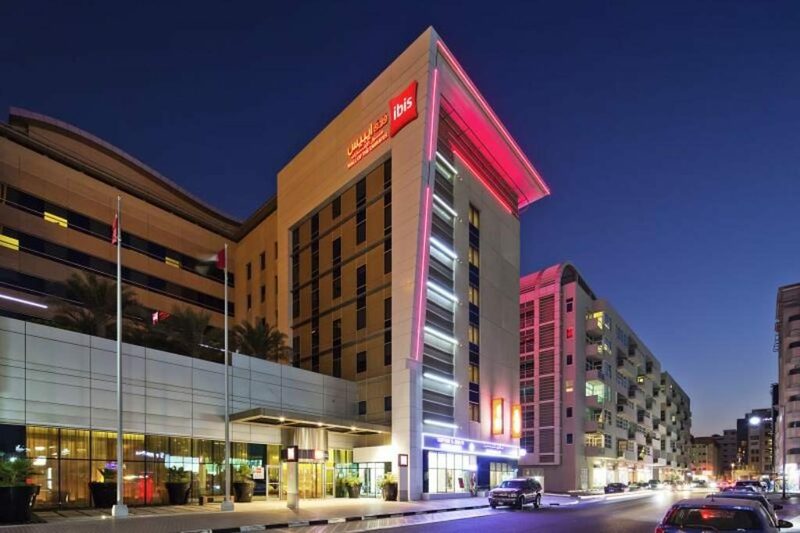 Here are the best places to stay in Deira. 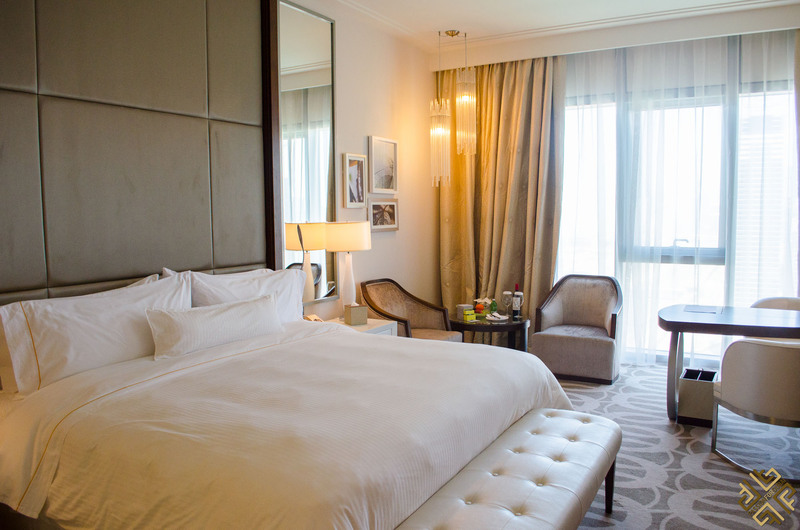 Rooms that revel in shades of cream and juxtapose with gorgeous hues of ivory and pearly, along with extravagant carpets and screens are just some of the best things about Park Hyatt Dubai. 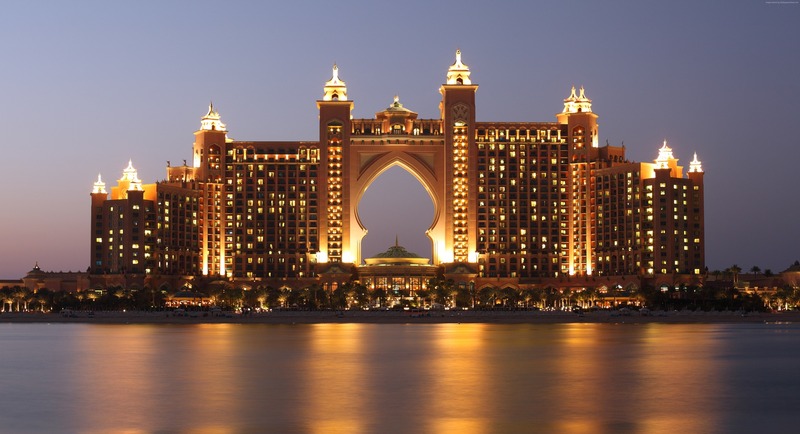 It’s a hotel that perfectly reflects the history of Dubai with the views of the creek that are simply unbelievable. There’s also a Thai Kitchen there that has a great atmosphere to try some authentic Thai cuisine , and a French restaurant that has a brilliant brunch that you can try. 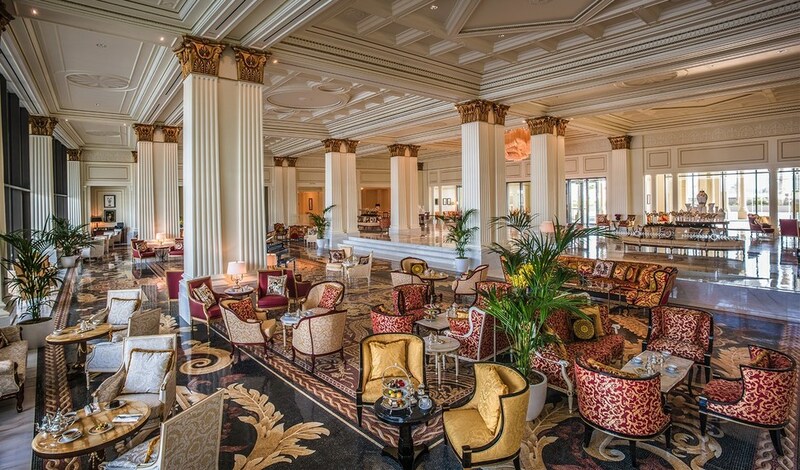 If you’re feeling a little more energetic, you can always try the bar at the Terrace. 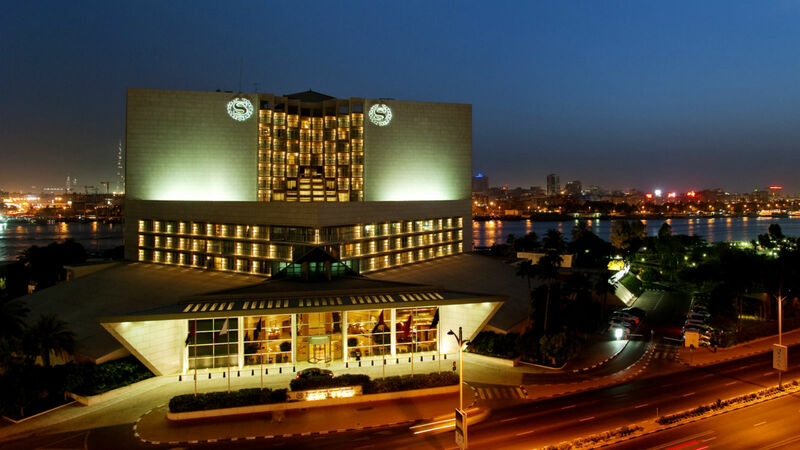 The Sheraton Dubai Creek will give you the definition of a “celebrity treatment”. Not only does it have a fitness center, but the hotel’s proximity to some major attractions gives it a great location. You’ll be very close to the Grand Mosque, the Floating Bridge, and the Textile Souk as well. The rooms are spacious and you can always choose one with river views, and enjoy the incredible buffet breakfast. There is also a sauna, table tennis, and much more make this place very special. 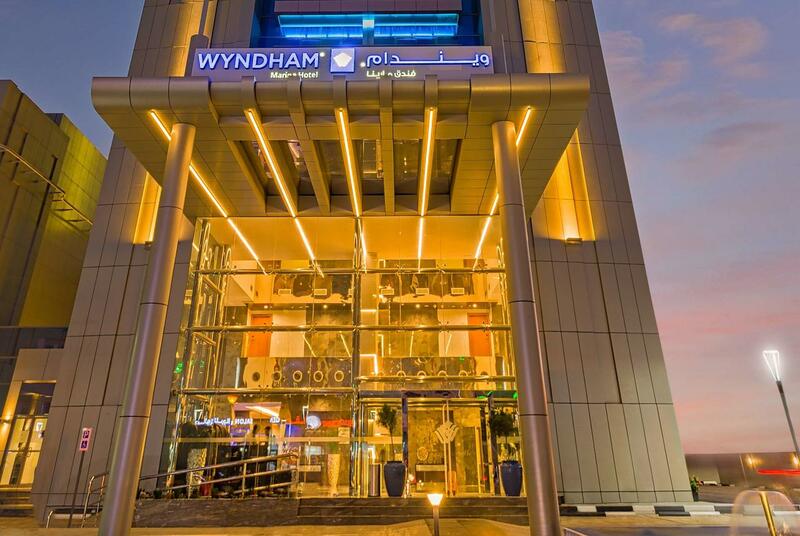 This hotel is quite close to the airport (only 10 minutes) and is the perfect place you can go to so you can embark on the ultimate culture adventure to Dubai. There is an outdoor pool where you can bask under the sun, try incredible food, or stay at the fitness center. Close to all of this is the airport and the Dubai Festival City and the Old Dubai. This is more than just a place to stay at – this is a whole entertainment area that is located right inside the Dubai Creek. It’s a place where luxury and leisure go hand in hand, and you can either spend some time at the Gold Club, or trying out the dozens of restaurants at the Canal Walk or even indulge in a major shopping spree at one of the 400 stores. If you’re looking for a great hotel to stay at in the Dubai Festival City then you have to choose this one. 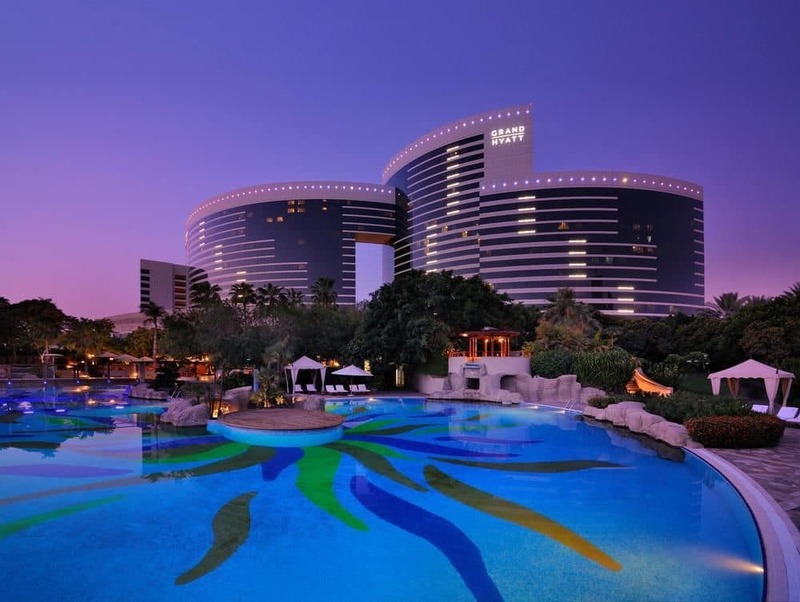 The restaurants serve an incredible variety of international food, there is a breakfast buffet, an outdoors pool and you are right in the proximity of Dubai Festival City. It also boasts luxurious examples of architecture and the rooms offer views of the skyline of the city. This is without a doubt the oldest part of the city and definitely one that will catch your interest. It’s where you’ll find the oldest features of Dubai seeping out and enchanting you with their history. Gorgeous buildings, Arabic skylines, curry houses and markets down Al Fahidi Street all add to the essence of this place. 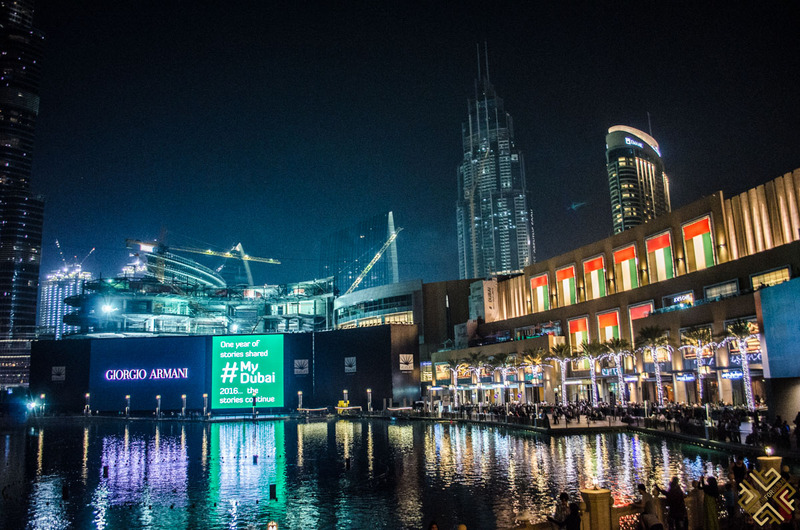 Make sure you check out the Dubai Museum which shows where the city was and where the city will be and reflects a plethora of artifacts relating to the cultural persona of Dubai. Check out the historical Iranian quarter called Bastakiya, or the other multiple attractions including Shindagha, Sheikh Saeed al Maktoum House, and of course – the textile souk. 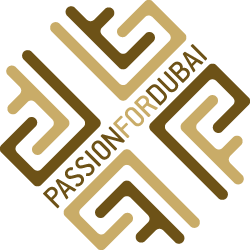 Below are our recommendations for hotels in Bur Dubai. The Raffles Hotel takes you back to 19th century grandeur. 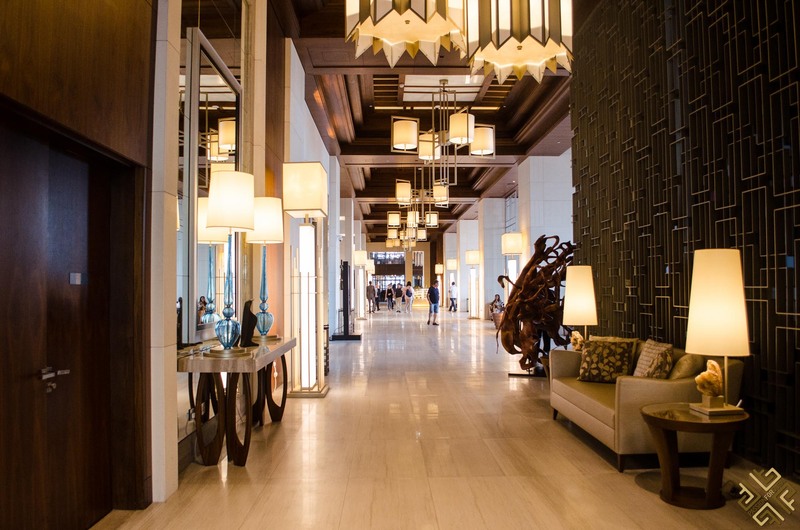 Space, pearls, undeniable style and galleries that seep their way through the hotels – Raffles is known for its impeccable service. 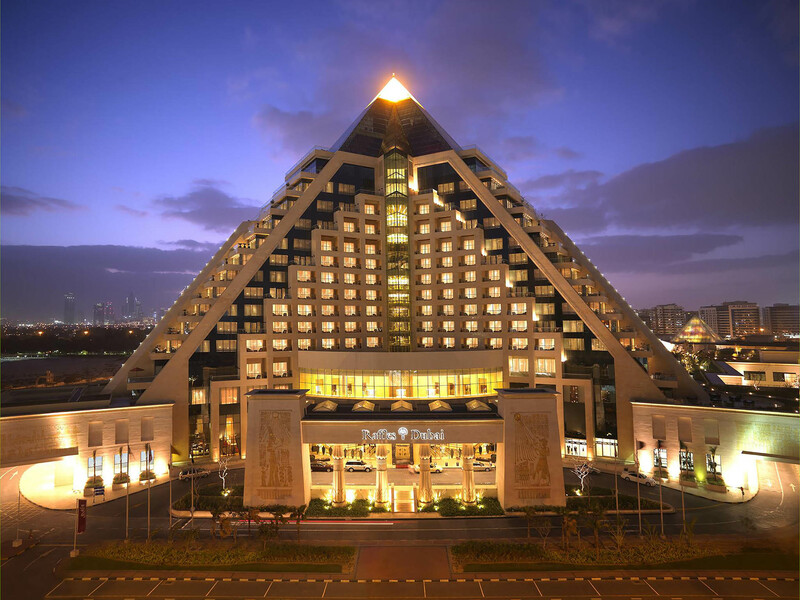 What makes it so unique is the fact that it’s an Egyptian-themed hotel with pyramid-shaped artifacts, sumptuous interior, gorgeous ottoman-style furniture and much more. 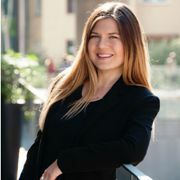 It’s a very busy hotel and has over 6 restaurants and drinking venues including a steakhouse, a seafood restaurant, a Japanese restaurant and much more. 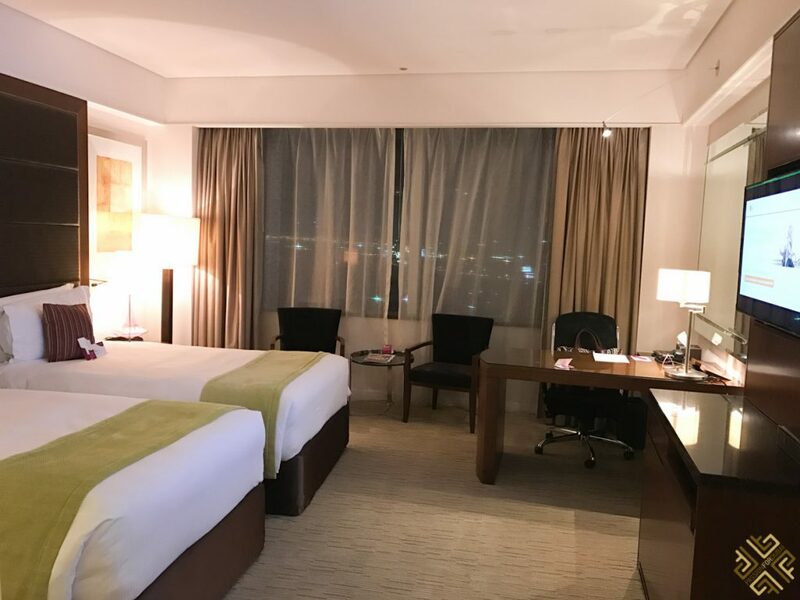 Very little hotels compare to the luxury of grand Hyatt, a 5 star hotel that is located right next to some of the major attractions like Burj Khalifa, Dubai Mall and the WTC. Of course, the airport is only 10 minutes away. There are the features of a resort and the features of a hotel, both together that show views of the skyline and the creek as well. The restaurants and bars there are award-winning so you’ll be pampered with the best gastronomical options. The spa and fitness center along with the indoor and outdoor pools make the hotel perfect for any type of traveler. 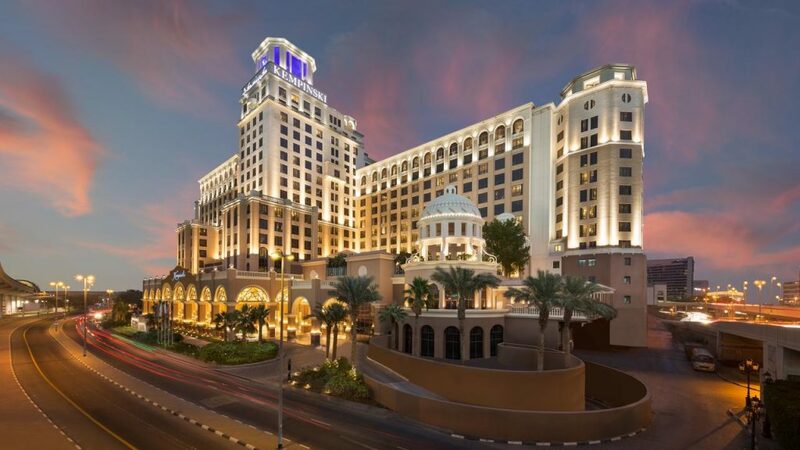 The Palazzo Versace Dubai fits perfectly with the “luxurious, glamorous” image of Dubai. It’s all about the bling, the gorgeous decorations and the undeniable lavishness of it all. The high ceilings and the architecture all give it the feel of a palace from the 16th century and for good reason. Huge chandeliers contrast glided columns, and marbles blend in with mosaics and of course – the Giradino restaurant is the cherry on top. 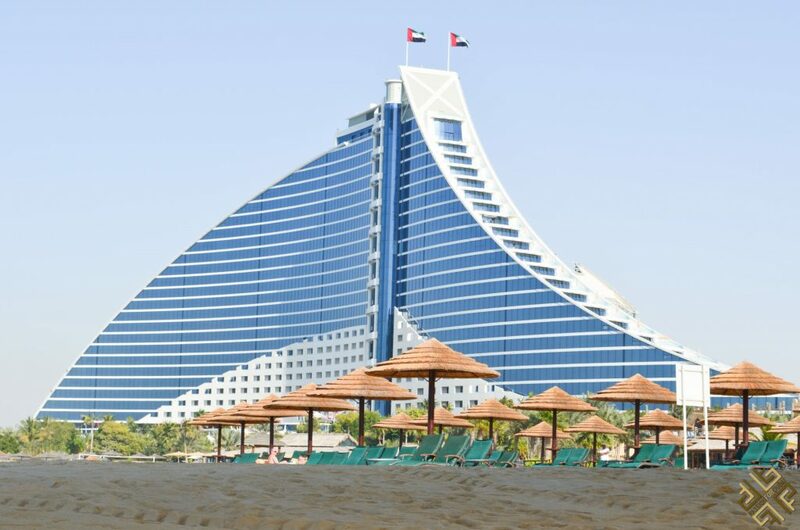 The Jumeirah Beach is the best public beach in all of Dubai without a doubt and one of the best areas to stay in Dubai. It’s where you can revel under the sun, enjoy the vibe of Dubai or indulge in all types of water sports. You can throw a barbecue or have a picnic or enjoy the several beach clubs lined up the beach. It’s quite a lively area with an all-you-can-do vibe that is perfect amongst upbeat travelers. 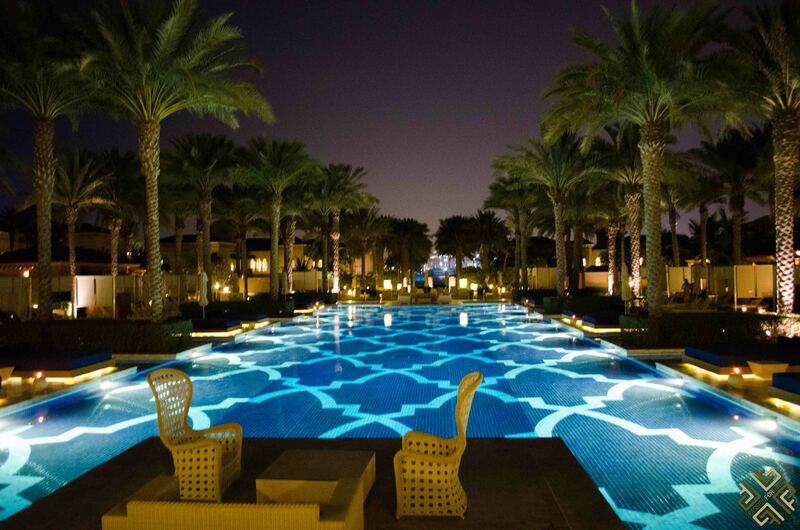 It’s simply one of the liveliest places to stay in Dubai. Where to stay in Jumeirah Beach, Dubai. One of the most famous hotels in all of Dubai and in the Middle East is Burj Al Arab. An eye catching edifice that is the epitome of luxury and grandeur. It is simply the world’s most luxurious hotel and for all the good reasons. Just walking by the entrance with the Porsche cars and Rolls-Royce giants. The place is intimidatingly incredible. The whole hotel is set on a man-made island made just for the hotel and the interiors are lavish, gold and marble. 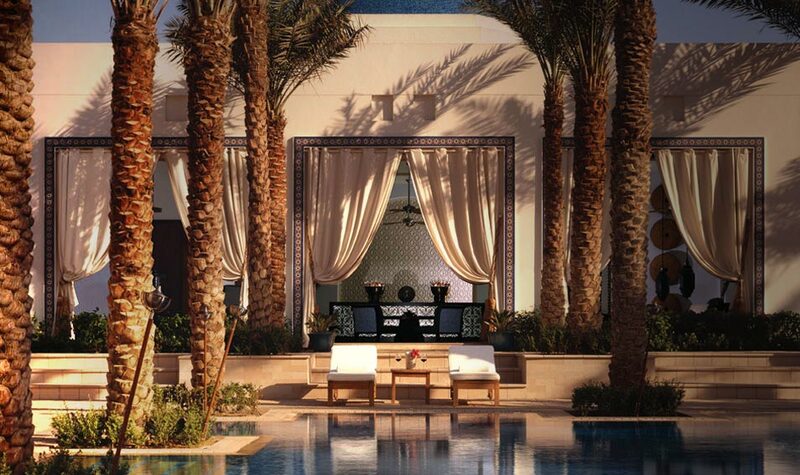 There is an incredible Moroccan-style spa, an 8:1 staff to suite ratio, and a pool, beach area, swim-up bar and more. The rooms are arranged over two floors…A good reason for the 7-star rating. 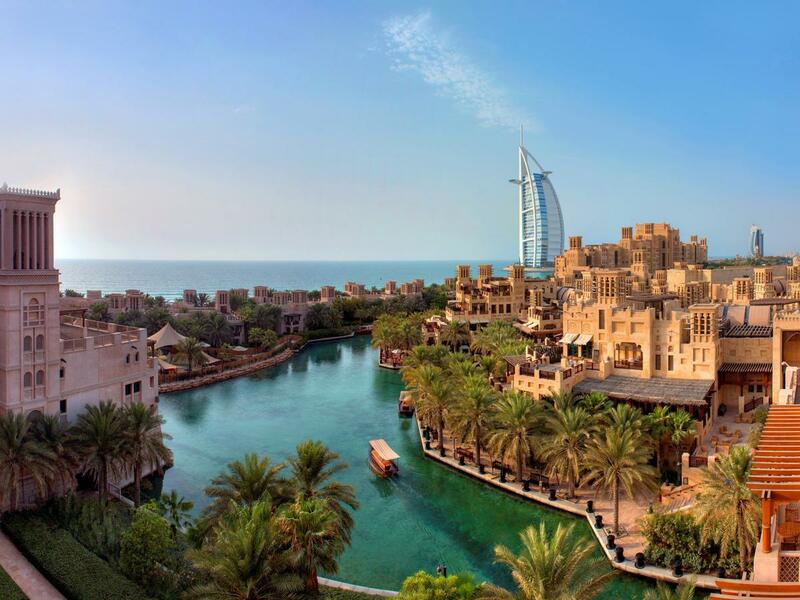 The Madinat Jumeirah is huge, and is kind of a miniature Arabic city with all types of towers, waterways, souks and five-star hotels. You’ll even be taken to your hotels in replica abras! The bazaars are incredible, the picturesque souks are to die for and you’ll find extravagance of Moorish and Arabic backgrounds in every corner. 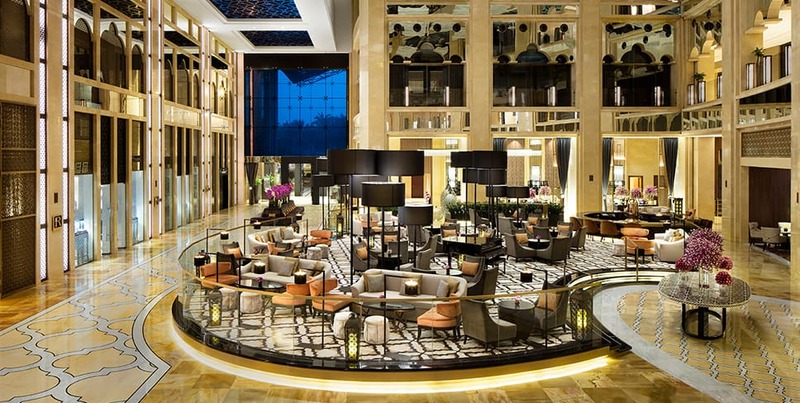 The Four Seasons is one of the most well-known hotels worldwide, and the one in Dubai is the same. Only 20 minutes from the airport, the hotel has over 237 rooms and the hotel stretches all over a private beach. Whether you want sweeping Dubai skyline views, Caribbean ran showers or gorgeous spas – you’ll find it all there. This is more of what is called a “low-rise resort”, where the beach is extremely close, pools are abundant and the rooms are gorgeous. Add on top of all of this a seafood restaurant and you’re set. 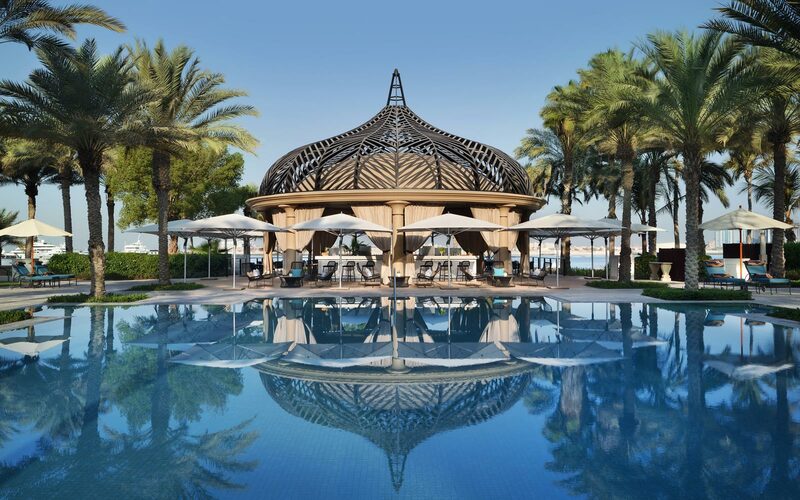 The longest private beach belongs to this resort and the complex is inspired by Arabesque architecture, with refreshing tranquil architecture in all the rooms. The focal point of this resort is the sea-facing gardens and the large pools along with the beach cabanas that are draped with white curtains. Every room has either a sea view or a garden view, so you know you’re in for a great view in all cases. This is another beach resort that actually has a waterpark right inside and is also inspired by Arabesque architecture, palm-fringed interiors and a general modern décor. Every room there has a sea-view! Above all of this, the services and facilities are the best part of this resort – you get six swimming pools that stretch over a private beach, and a waterpark that has all types of watersports, and even some sports courts (tennis and squash). There is a diving center, a gym, a spa, and very little details that make your trip worthwhile. There are over 21 restaurants to choose from – from British pubs to Italian restaurants to North Indian cuisine…The options are practically endless. 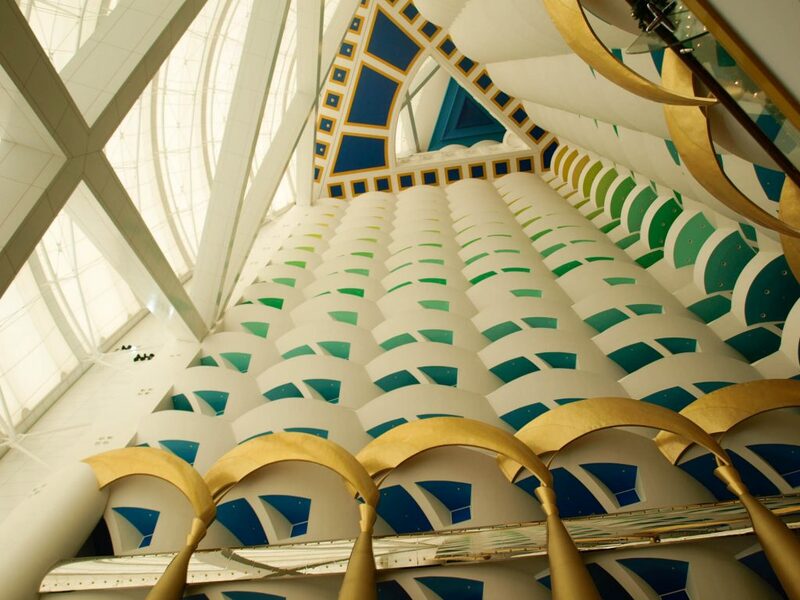 The hotel looks exactly like what you’d imagine Dubai to be if you closed your eyes. Extremely luxurious, lavish exteriors, magnificent towers and much more – this place is a fairytale that has come to life. 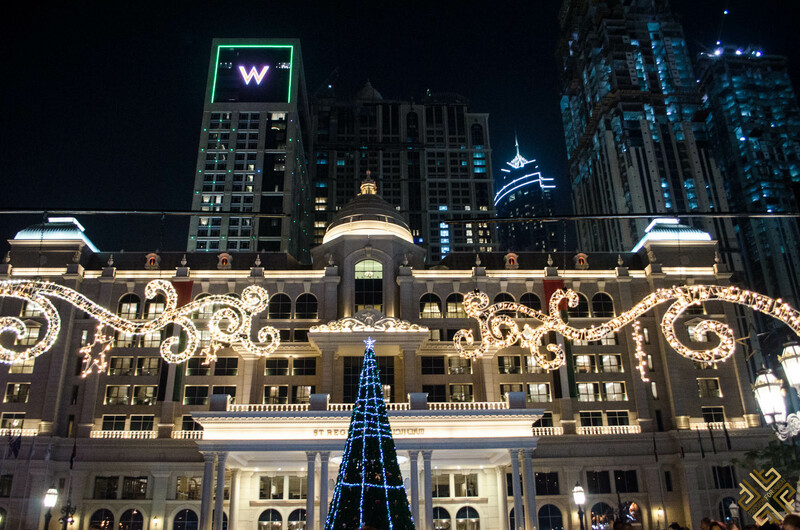 From the fairy lights that snake their way up soaring palm-trees, to the imposing backdrop of huge buildings and skyscrapers, what’s not to love about this hotel? There are rooms divided into four different sections – from the Palace, to the Arabian Court to the beach Garden Villa. This area is perfect if you want to stay somewhere for a conference taking place at the WTC, and it also has very easy access to the metro so you’ll be in near proximity to the attractions if you take the metro in the end. The H Hotel is elegant and is perfect for the business-traveler type. It’s for people who are coming to attend conferences. It is not the most lavish of all properties in this list but it still has all the needed amenities and more. 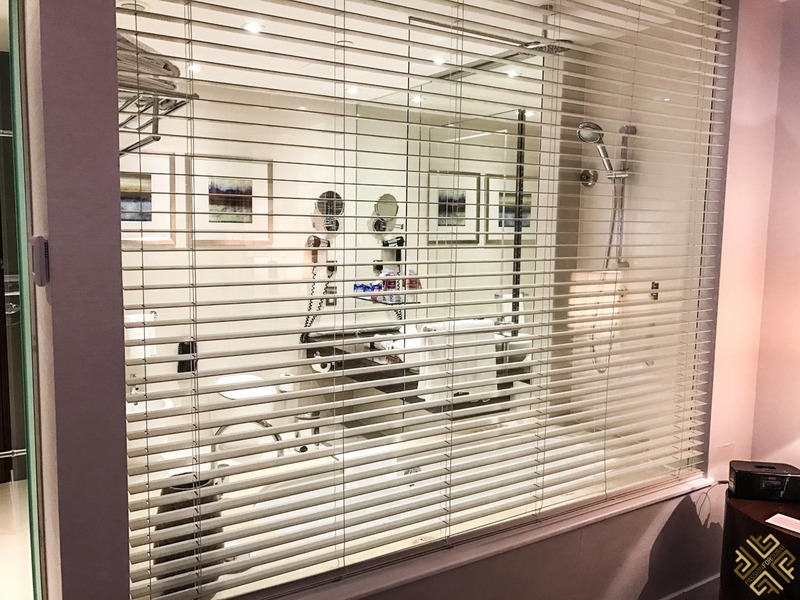 The rooms are gorgeous and boast marble bathrooms and WiFi and you can even choose to stay in apartment-like rooms where you can have your own private kitchenette. There is an outdoor pool, a spa, a rooftop lounge where you can have a cocktail, and a Japanese restaurant along with a staggering 11 restaurants. 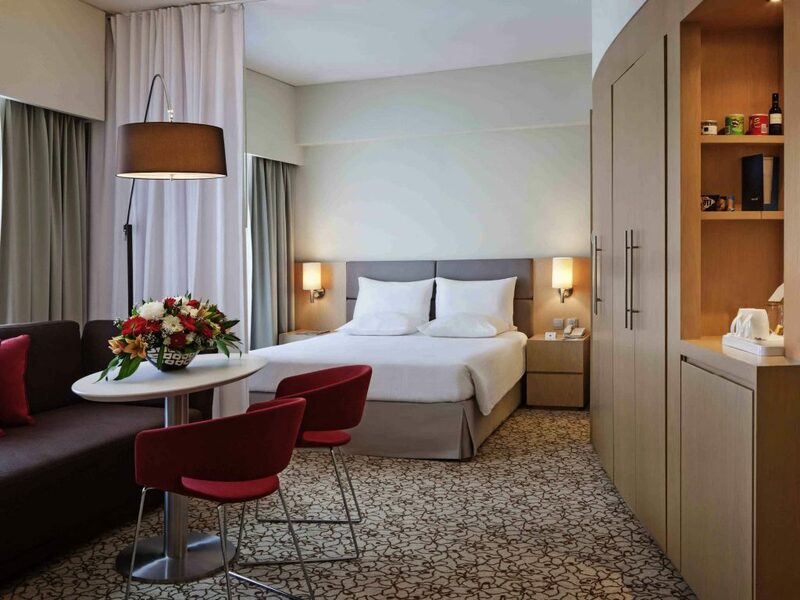 The Ibis World Trade Center is a 210-room hotel that has all the amenities guests may need. There is free WiFi, a restaurant, a bar, and it’s near to some of the major attractions like Burj Khalifa. 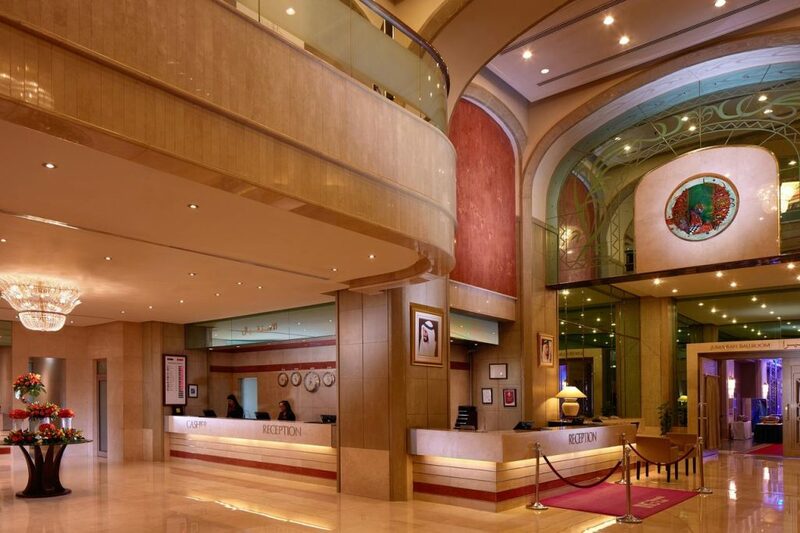 The Crown Plaza boasts 560 rooms and a dozen restaurants along with standard architecture. There is a pool, a health club, and the location is quite central making you a mere 15 minutes from all of the main attractions. The Dubai Mall is the largest shopping mall in the world and is a major entertainment hub in both, Dubai and the world. It’s where you can spend a day moving from strolling around shops, to skating on ice rinks to exploring the plethora of souks and hundreds of options there. 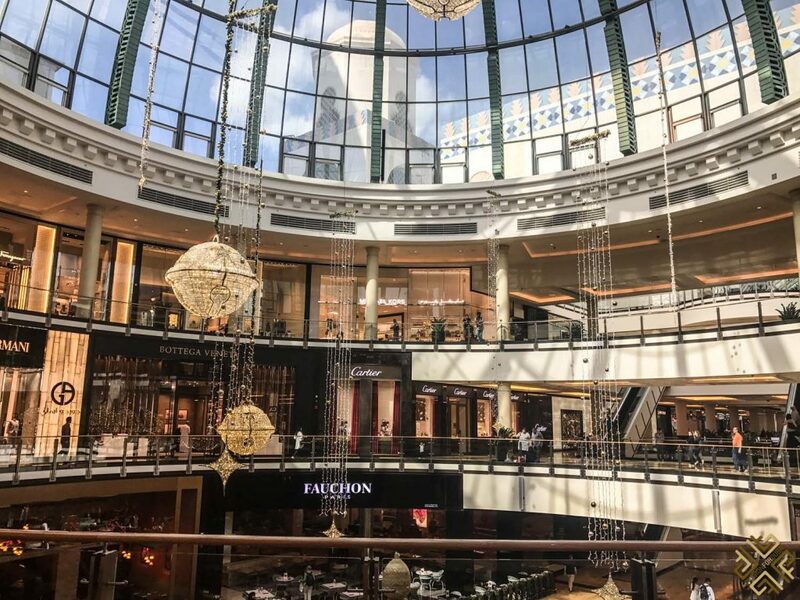 Whether it’s visiting Galerie Lafayete or getting lost at the Gold Souk…You’ll need at least a few hours for the Dubai Mall. 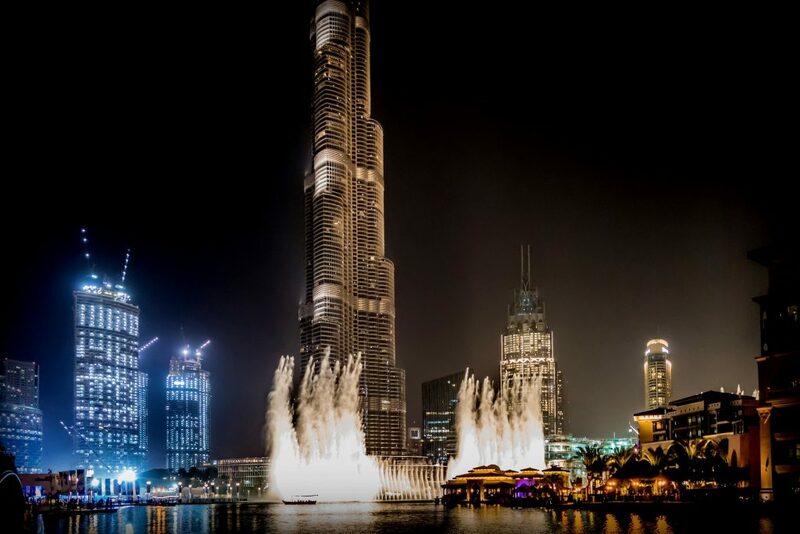 The Burj Khalifa has dominated the skyline of all of Dubai and has taken up all the superlatives needed for buildings. From sweeping panoramic vistas, to gorgeous architecture, this is a place you need to visit at least once in your lifetime. 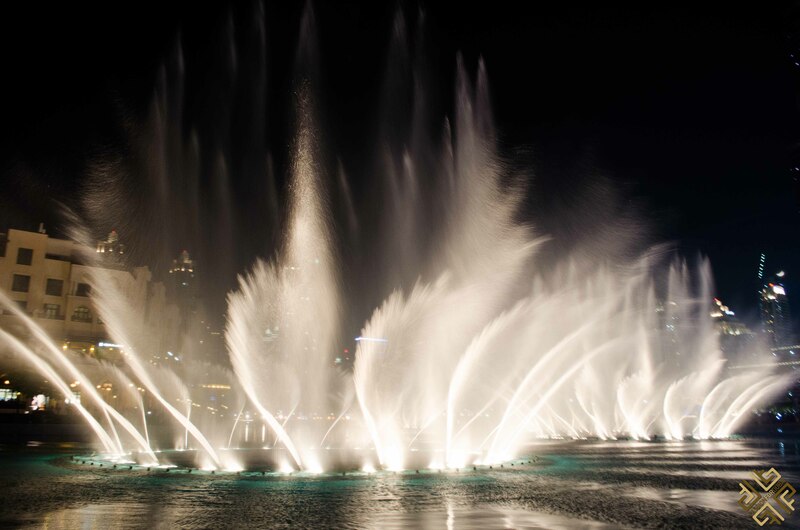 The fountain moves to the beat of the music and the light and plays every day from 6 to 10 pm and you can even have an Abra ride along the lake. 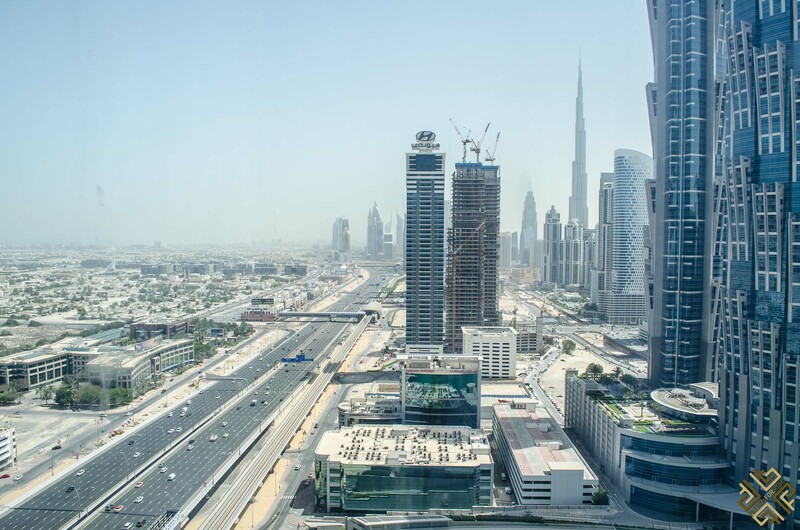 Below are the best hotels near Dubai Mall. This mall is the perfect representation of Dubai. 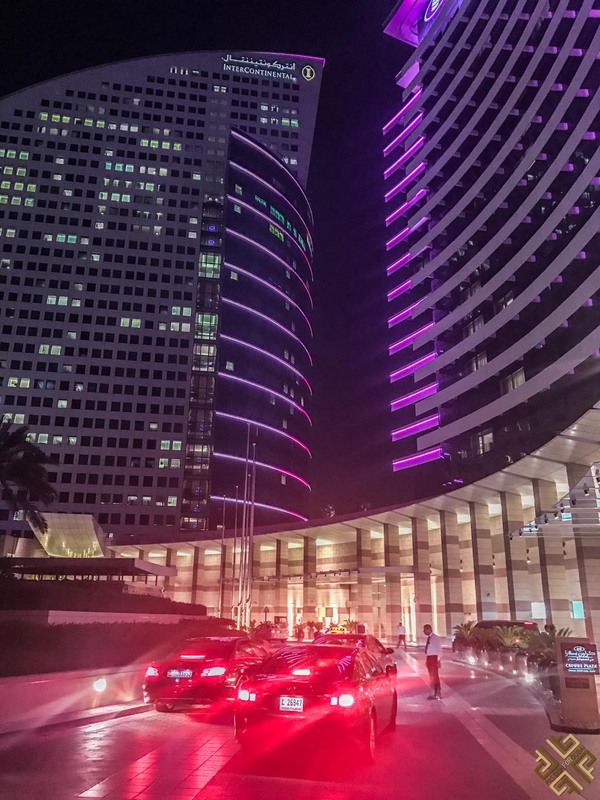 Luxurious and grand, the hotel is connected to the biggest shopping mall in the world. Of course, the room and the amenities are nothing less of luxurious but are also meticulously blended in with the Arabian culture. From the Karat lounge to the Cabana Restaurant, to the fitness center. You’ll immediately feel right at home. This hotel is located near Burj Khalifa and is considered more central and has restaurants, a fitness center, a spa, and incredibly luxurious rooms with glass windows that take up the whole wall and show panoramic views of Dubai. Also a few moments away from the Burj and Dubai Mall, this place offers an opportunity for luxurious long-term living as well as short-term. The penthouses offer the most beautiful views of the whole neighborhood, and the restaurants offer the best international cuisine, while the largest shopping complex is only 5 minutes away. 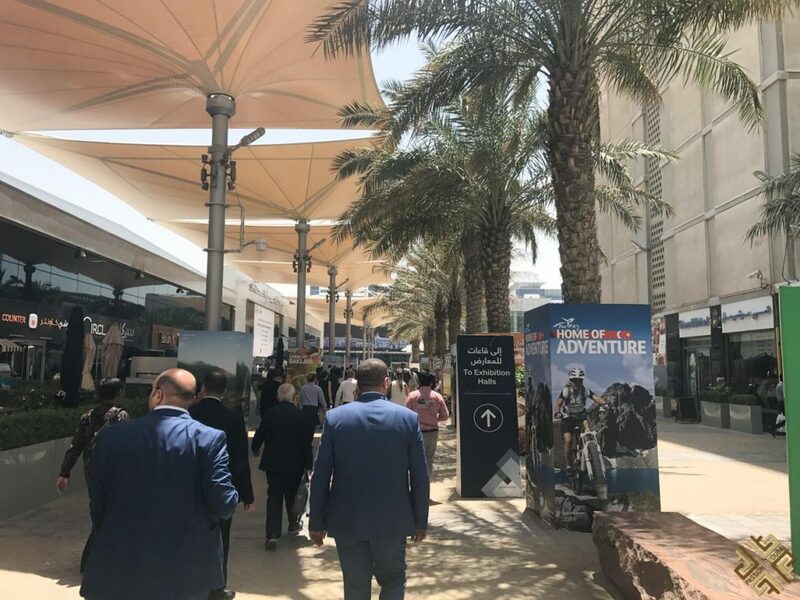 The southern leg of Sheikh Zayed Road Shoppers spend the day in air- conditioned art galleries and the Mall of the Emirates and Ibn Buttuta shopping centers. 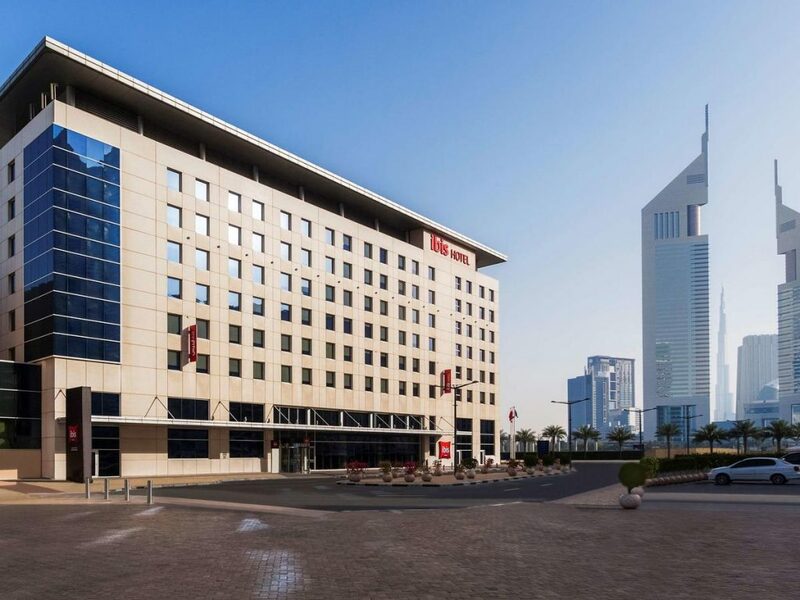 Ibis Mall of Emirates is a great option if you want to spend less money on your hotel and more money on your experiences in Dubai. The rooms are extremely clean, and there is also an on-site bar. You’ll find an Italian restaurant, modern furniture and a buffet breakfast as well. 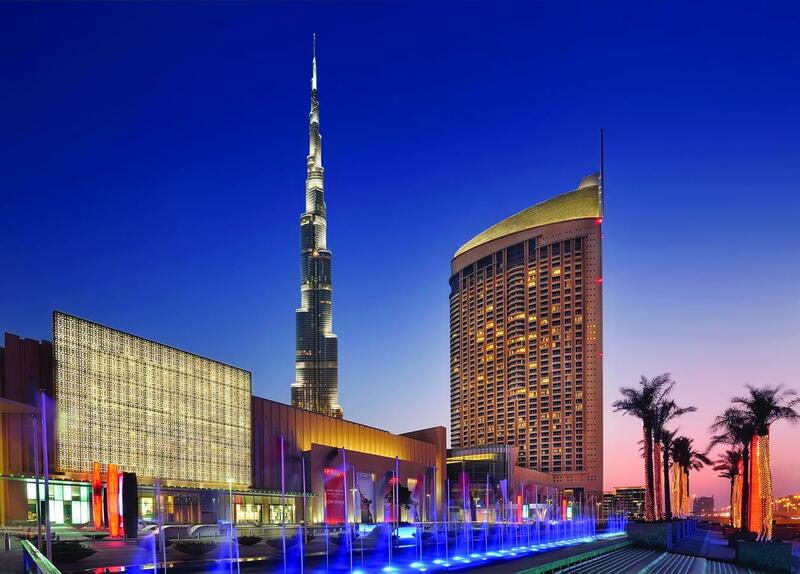 The best thing about the hotel is its extreme proximity to the Mall of the Emirates and the Dubai Airport. It’s a 5 minute walk to the Mall of Emirates and only a 10 minute ride from the airport. 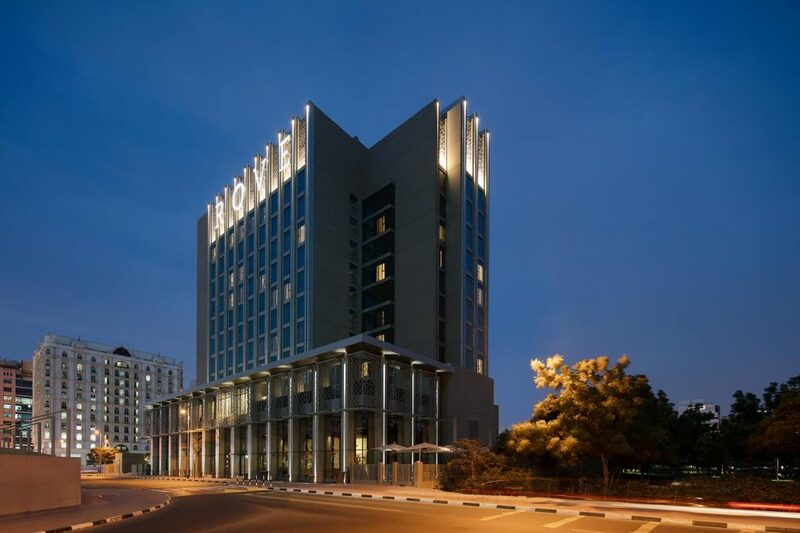 Novotel is only a 10 minute walk from most of the major attractions and boasts over 180 rooms. It’s another great option if you don’t want to splurge too much on your rooms. There is a bar and a restaurant and a café as well, along with buffet breakfast. There is also a Nandos Chicken restaurant on premises. You’ll find free WiFi in all of the rooms and there’s even an outdoor pool and a children’s pool as well. The Kempinski is a five-star hotel that exceeds all expectations in Dubai. Long story short? There’s a whole indoor ski slope inside and it’s very close to the Mall of the Emirates. 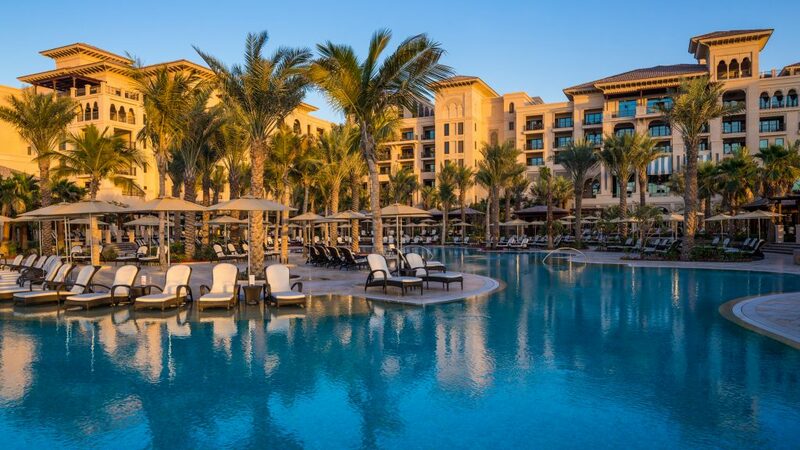 The rooms show off lavish interiors that reflect the Arabian culture and the services include two pools, a spa, a tennis court and a whole business center as well. 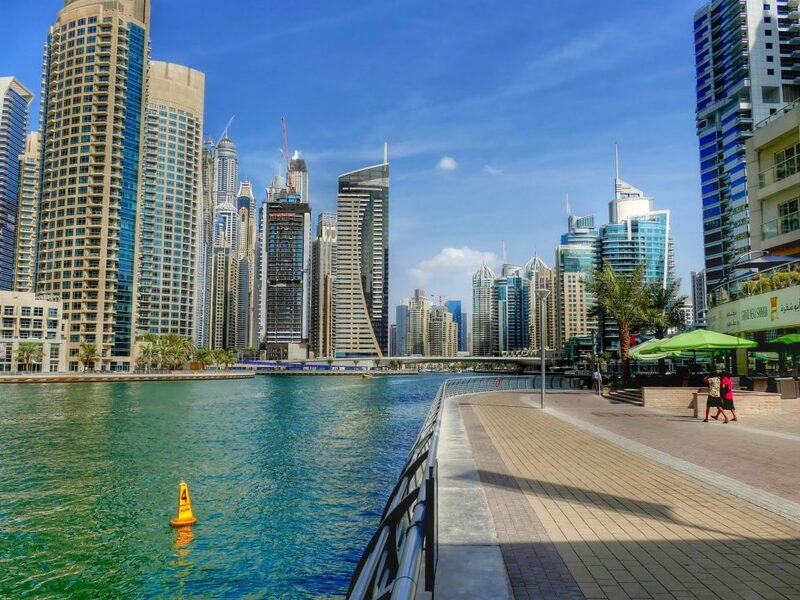 The Dubai Marina is a man-made marina that has changed what Dubai is. It’s the heart and soul of the city, and is a perfect stretch of lakes snaking their way through million-dollar edifices. Yachts pass by hotels, public beaches juxtapose with shopping zones and industrial towers soar into the sky. Staying there is a great option as you’ll be right in the center of a very lively part of the city. There’s also the JBR beach close by and the Jumeirah Lake Towers as well. The hotel’s best feature is the infinity pool and how it perfectly caters to all types of travelers – the business travelers and the pleasure-seeking ones. 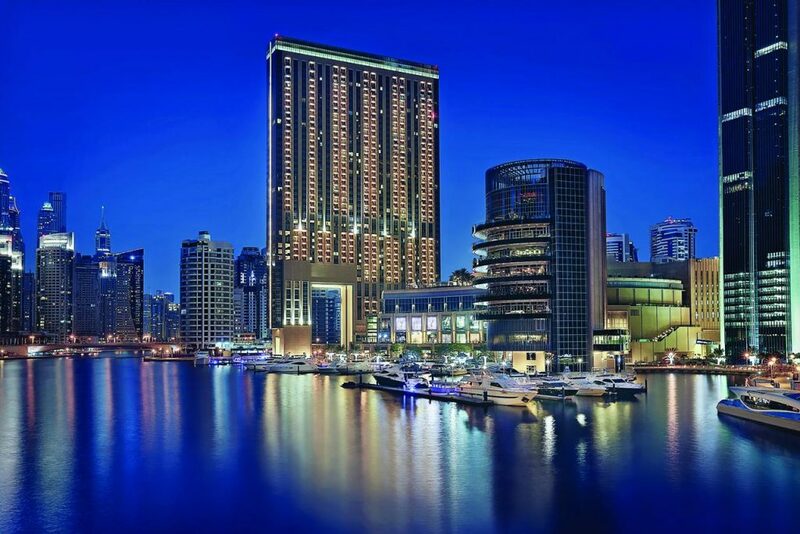 The hotel overlooks the marina and you get direct access to the Dubai Marina Mall from inside of the hotel as well. All rooms are contemporary and modern, with neutral colors and marble designs. It’s a non-showy business-oriented hotel. There are also cabanas that look over the marina and a pool just for children as well as a wellness and fitness center and hair salon. You can check out the Mazina restaurant, or the pool restaurant or the Ruth’s Steak House inside. Only a 20-minute walk from the Dubai Marina, the hotel boasts a great swimming pool and 2 restaurants along with over 300 rooms with free WiFi. Make sure you check out the Alloro Ristorante as it’s one of the best restaurants specialized in Italian cuisine and revel in the energetic atmosphere of the hotel. The Palm Jumeirah is not just an island in Dubai, but also one of the main attractions of the city and home to some of the most luxurious hotels in all of Dubai. An underwater-themed resort sounds like a dream to many people. But Dubai begs to differ. The Atlantis resort boasts a staggering one mile of private man-made beach and two huge pools. You get to enjoy the waterpark next door, the lagoons, and the aquarium as well. It’s the perfect place to go to if you have your family with you. If you’re looking for seclusion and privacy then One & Only is the place to go. Three Michelin-starred restaurant, spa treatments and pools – you’ll be getting the pampering and privacy you’ve always wanted. It follows a Moorish/Andalusian architecture vibe and you’ll see that in all the fountains and the motifs and edifice around. You’ll be spending your days lazily basking under the sun on lavish cabanas or even swimming in the lap pool. All the rooms in the hotel feature either a private balcony or your own terrace and you can even choose a room with your own pool with it. Al Habtoor City consists of 3 major luxurious hotels and is a place where a lot of long-term residents live. Other than the hotels, the city consists of many bars and restaurants to choose from. 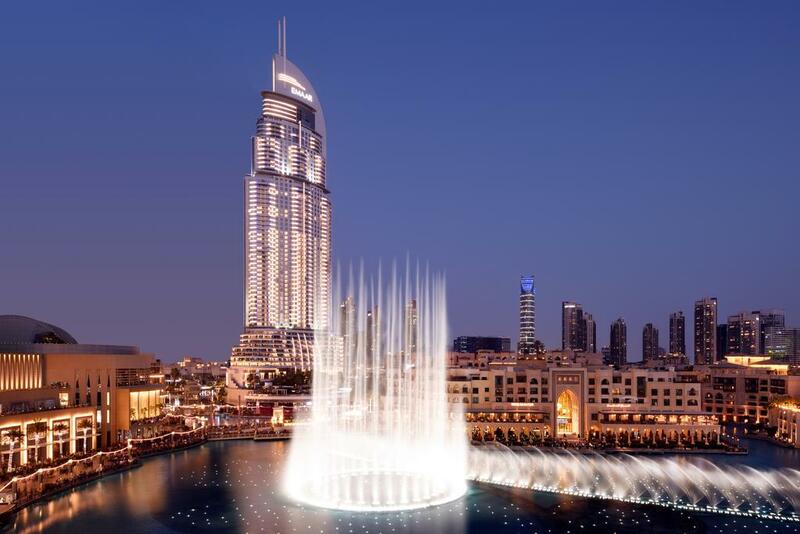 This vibrant hotel, standing 41 stories tall on the Sheikh Zayed Road with incredible views of the iconic Burj Khalifa tops the list of the best addresses in Dubai. At The Westin Dubai, Al Habtoor City you can indulge in the world’s top cuisines. The hotel features six dining venues to choose from. If you wish to relax and unwind, a visit to the Heavenly Spa is a must. This signature Spa features 20 treatment rooms which span across an area of 4,000 square meters. 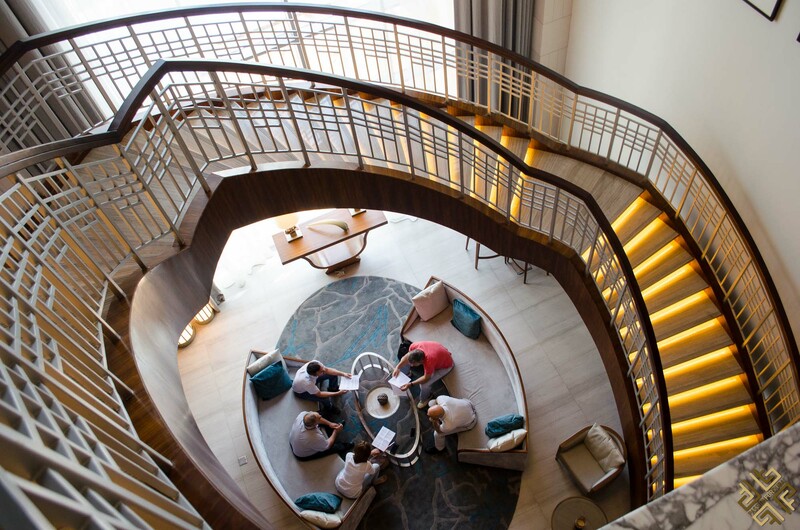 Marble staircases and five star-luxury along with elegant architecture makes this hotel stand out. There are about 234 rooms there, a French restaurant and a World Cut Steakhouse. 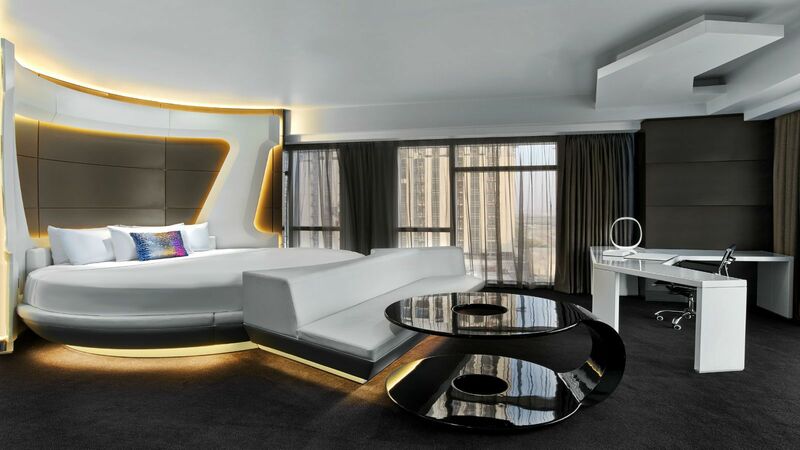 The W Hotel is a world-renowned hotel and it’s considered quite a hip hotel to visit. The Wet Deck is definitely the place to party and pop champagne while the rooms are very modern and quite inviting after a long flight. Make sure you check out Namu (Japanese and Korean cuisine) or Level Seven (Mediterranean flavors) or party at the club!